Official synopsis: "More Four! Fans of the Divergent series by No. 1 New York Times bestselling author Veronica Roth will be thrilled by ‘The Transfer’, the first of four new short stories told from Four’s perspective. Each brief story explores the world of the Divergent series through the eyes of the mysterious but charismatic Tobias Eaton, revealing previously unknown facets of his personality, back story and relationshops." 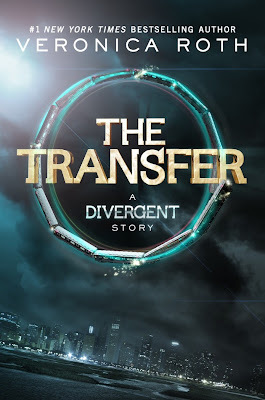 The Transfer is the first of four short stories in an episodic series about one of our favourite characters to come from Veronica Roth's Divergent trilogy. Four, or as he is also known Tobias, himself. It is, as I've already mentioned, a short story. Amazon says it comes in at about 24 pages, but there's quite a bit packed in to this little volume. We meet Tobias back in his Abnegation life, with his father terrifying the life out of him. I really like that, and it looks like we're going to get more, we get an insight in to his thinking, his mind. We see the internal conflict going on as he tries to decide between factions and whether or not he can bear to stand the rest of his life under his fathers gaze and fists. This is well written and very good, and whilst it is quite similar to Tris' own entrance to Dauntless life, it's great to get someone else's perspective, and well, you can never get enough of Four. I'm really looking forward to seeing how he develops into the character we meet in Divergent. I for one cannot wait to read the next three parts of this little collection to get more of an insight into Tobias. There's a break in the release of these novellas next month because we get the biggie itself, the final book of the trilogy, Allegiant, and there's nothing in November so I'm guessing HarperCollins and Veronica think we need a month to calm down after reading the finale! So... The Initiate follows in December, The Son in January and finally The Traitor in February and then there'll be a bind up of all of them released in physical form, which I for one cannot wait for. I love the US cover because it looks exciting so I'll definitely be importing that in when it comes out in February! What a wonderful review! I truly need to read this one asap!